The show opens up with a short introduction from commentators Michael “The Voice” Schiavello and Frank “Twinkletoe” Trigg, followed by a short teaser video of things to come later this year, advertising the Dream vs Strikeforce angle. See, I’m not the only oriental person with a mullet. Minowa opens up the show in typical Minowa fashion, fighting against someone nearly 100 lb. heavier in Jimmy Ambriz. And of course, in typical Minowa fashion, he fights on showing his bushido spirit and grappling prowess for an exciting opening fight. Kikuno, the karate-ka with “the creepiest smile in the world”, as noted by The Voice, and comes out firing against Hironaka, forcing a fast paced striking contest for the place of 3rd best Japanese fighter (after Aoki and Kawajiri). Maeda catches the hype too, coming out cocky and taunting the Strikeforce champion Escovedo, utilizing his superior speed to keep it on the feet, not wanting to get into a Jiu Jutsu match against the self-proclaimed “King of Triangles”. Escovedo enjoys a reach advantage, however, and is content to keep the fight standing, creating an interesting dynamic of speed and technique superiority versus range superiority. 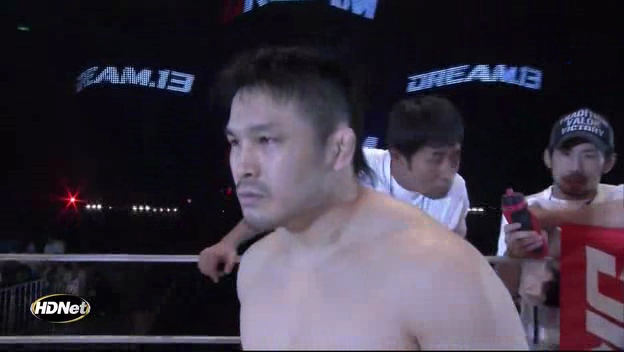 Perhaps the most interesting fight of the night was Ryo “I change my nickname between every fight so hopefully people forget how badly I embarrassed myself last time” Chonan returning against the Japanese-Brazilian, Andrews Nakahara. Ryo uncharacteristically doesn’t embarass himself, barring the horrendously whiffed uppercut he threw early in round 1. He pushes the standup pace with his piranha-like aggression and puts Nakahara’s ground skills to the test. Ryo being as aggressive, and as blind, as a piranha. After a short intermission, action picks up again with K.J. Noons pitting the finesse of his boxing against the wild counter punching of Dida. Noons also displays some of the best slipping and dodging I have ever seen in any fight sport. Noons’ constant pressure and forcing the pace keeps the fight exciting, as Dida characteristically backsteps for 15 minutes, waiting for countering spots. 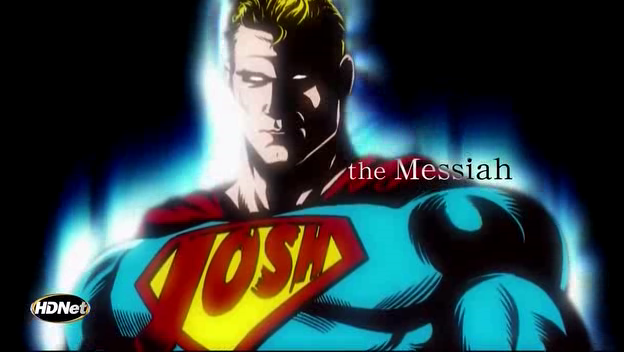 This is followed by the much anticipated return of Josh Barnett against former K-1 champion, Mighty Mo. The fight carries on exactly as you would expect, with Mo using his striking technique and strength to keep Josh at bay, knowing he’s going to be submitted as soon as it hits the ground. The fight also contains the sickest groin strike since Alistair kneed Crocop’s balls in last year. “Kyuseishu” has an aura. I’ve seen it, it’s blue. The championship fight between Fernandes and Hansen is perhaps the most disappointing fight of the night, but still very exciting. Clearly, the weight cut took a heavy toll on Hansen, as we don’t see his usual aggressiveness or explosiveness. While still lacking in takedown defense, Hansen shows he still has an incredible ability to scramble and escape, keeping much of the fight a standup war. Fernandes has been no slouch these past months, however, and displays massively improved striking ability. Early into the first round, a takedown attempt by Minowa goes horribly wrong and ends up with the 290 lb. Ambriz on top. Minowa survives long enough for the ref to stand them back up, for the price of a yellow card (stalling). However, Ambriz is clearly fatigued, and Minowa starts picking him apart in the standup with some quick in and out overhand rights. This continues up until halfway into the second round, when Jimmy decides to take it back to the ground. He almost takes Minowa’s back, but left his hips up too high, allowing Minowa to reverse him and end up in half guard. Jimmy tries to hold on here, but it isn’t long before Minowa manages to posture up, after which he immediately dives for the far leg, getting the submission victory with a beautiful toe hold. Minowa taking advantage of a fatigued Ambriz on the feet. Kikuno vs. Hironaka ends quickly, with Kikuno immediately overwhelming his opponent with snappy strikes. Kikuno lands a crescent toe kick to the liver, buckling Hironaka, and combos into a full powered right hook to the jaw, sending his foe to the canvas and earning victory. Maeda comes out cocky and reckless, as usual, and does well at first, battering the ground specialist Escovedo with his speed. However, Escovedo has more reach and knows how to use it, and it isn’t long before he causes Maeda to stumble with a right low kick, lowering his head. He follows up with a left high kick while Maeda tries to stand back up straight, and lands it perfectly on the jaw, putting him out cold, eyes still open and all. Ryo stated in his prefight video that he’d use all the MMA techniques available to him, and that’s exactly what he did. He starts off by rushing and overwhelming Nakahara with wild strikes, eventually causing the half Brazilian to lose balance. Once it got to the ground, it was all Chonan raining ground and pound and achieving dominant positions. Andrews showed that he didn’t have much of a ground game, attempting a sloppy triangle choke and missing an armbar opportunity. Eventually his ground passiveness awards him a yellow card, after which Ryo continued to batter him on the feet. With just a few minutes left in round 2, Andrews feels the desperation and finally opens up and rushes Ryo back with a wild flurry of hooks and knees. Chonan is content to exchange for a bit and takes quite a few hard shots before realizing he’s lost his stand up advantage. He immediately changes tactics and slams Andrews with a double leg takedown and continues to dominate the fight, securing his decision win. Ryo Chonan actually dominating someone. KJ Noons makes his MMA return, bringing all the skills he learned from pro-boxing into the ring against the wild hooks of Andre Dida. It starts off evenly matched, with KJ picking Dida apart with jabs and Dida answering with leg kicks. KJ’s power punching is neutralized by Dida’s constant backstepping and double forearms guard, forcing him to go to the body often. At the same time, Dida’s wild hooks are neutralized by KJ’s excellent slips and weaves. 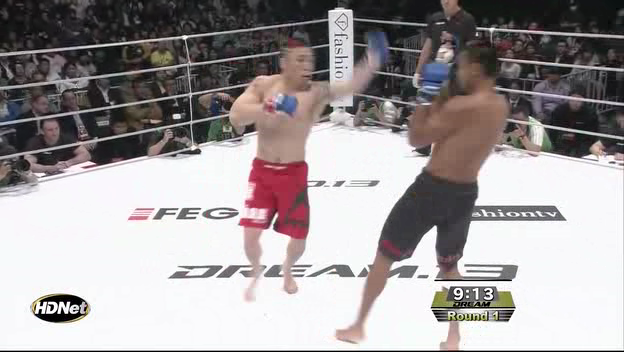 After 6 minutes and referee Yuji Shimata warning both fighters, asking for more action, KJ is clearly annoyed by Dida’s unwillingness to stand and trade and really starts pushing the pace. It’s all downhill for Dida from here, being unable to kick walking backwards and unable to land anything significant on the elusive KJ, who continues to pick Dida apart with hard body shots and swift boxing while constantly pushing forward harder and harder, winning a unanimous decision win from the judges. KJ Noons slipping past a right hook from Dida, his own hook fully cocked. Josh and Mo go on as you’d expect, with Mo having a slight advantage during standup exchanges and using his raw strength to stuff the takedown attempts. One of Josh’s front kicks goes wrong and hits Mo square in the nuts as he was coming in, sending Mo down hard. It took Mo 15 minutes to recover from it, but fortunately, since this isn’t the UFC and they don’t follow arbitrary rules regardless of how inappropriate they are for the situation, the fight is allowed to continue. Another 2 minutes of standup exchanges, and Josh finally manages to bullrush Mo against the ropes and complete a double leg takedown, after which Josh immediately gets a kimura/armbar tapout. Josh offers a free groin shot back, which Mo takes and knees Josh in the balls after the fight. He’ll probably have to get used to it, as we all know this fight is just to reintroduce Josh in preparation for Josh vs Alistair Overeem. Finally, the championship match between Fernandes and Hansen, while exciting, was disappointing for fans who’ve watched any of Hansen’s other recent fights. The weight cut clearly slowed him down, allowing Fernandes to make up the difference in reach with speed. By keeping a low posture, Fernandes was already ready to shoot and was too short for Hansen to reach anything besides his head, giving him an easier time defending against the striking expert. Fernandes was able to take the fight to the ground briefly on a few occassions, and ironically this was where Hansen was able to do the most damage, creating distance and landing upkicks before quickly scrambling back to the feet. Fernandes was able to pick up on this and decided to just stand and trade for the second round, earning a close split decision victory.